A student completes classwork online. St. Scholastica's online Master of Education program is named one of the top 50 in the nation by U.S. News and World Report's new 2017 online program rankings. The M.Ed. program is no. 47 among the Best Online Graduate Education Programs and is the only Minnesota online M.Ed. program listed among the top 100. "This ranking speaks to the quality and relevance of our curriculum, the dedication of our faculty, and our ongoing commitment to providing an excellent experience utilizing the latest technologies and research-based educational practices," said Jo Olsen, Dean of St. Scholastica's School of Education. "The significant growth in the M.Ed. program attests to the flexible program options and the ongoing support provided to our online students." 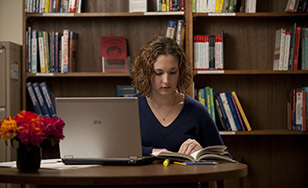 St. Scholastica's 100 percent online Master of Education program features six elective concentrations so that participants can customize their degree to fit their learning needs. The 33-credit program can be completed in as little as two years, and uses a cohort model that allows students to move through the program with the same group of colleagues. Each student works with an online program advisor, and can take advantage of a 24-hour help desk. For more information, visit css.edu/med. St. Scholastica's Doctor of Nursing Practice program, which includes a Bachelor of Science to DNP and a post-graduate DNP track, is included on the U.S. News and World Report list of 2017 Best Online Graduate Nursing Programs. St. Scholastica is one of only two Minnesota colleges on this list, which includes 144 colleges. It is unranked on the list, meaning its specific numerical rank was not published. "Our Doctor of Nursing program prepares nurse practitioners in three population foci areas: family, adult-gerontology primary care, or psychiatric and mental health," said Julie Anderson, Dean of the School of Nursing. "Our students are prepared for organizational and systems leadership to improve patient, clinical and health systems outcomes in a manner that reflects the caring and compassion of St. Scholastica's Catholic Benedictine values."